Brasilia, 14 October 2014. 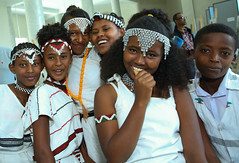 – Within the framework of the Brazil–UNICEF Trilateral South–South Cooperation Programme, the Government of Brazil hosted a high-level mission of the Government of Ethiopia between the 15th and the 20th of September. The objective of the mission was to get insights on how Brazil has advanced in providing Water, Sanitation and Hygiene (WASH) in urban areas, which has reduced child mortality significantly. Ethiopia is currently urbanizing at a 6 per cent rate per annum and is predicted to become one of the most populous urban nations in Africa by 2050. Thus, the Ethiopian Government is expected to face complex challenges in terms of expanding access and improving quality of WASH services for its growing urban population, especially for the most vulnerable groups. Through the visit, Ethiopia is keen to learn from Brazil, a country that has faced rapid urbanization over the last 50 years. 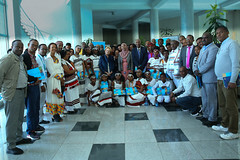 The delegation was composed by high-level government officials from Ethiopia, including Dr. Kebede Worku, State Minister of Health, Mr. Kebede Gerba Gemosa, State Minister of Water and Energy, and Mr. Wanna Wake, General Director of the Water Resources Development Fund and Member of the Parliament. In addition the mission included representatives from the Ministry of Urban Development, Housing and Construction; Oromia Water, Mines and Energy Bureau; Amhara Water Resources Development Bureau; Water Resources Development Fund; Tigray Water Resources Bureau; Somali Water Resources Development Bureau and World Vision Ethiopia as well as Samuel Godfrey, WASH Section Chief, and Michele Paba, Urban WASH Manager of UNICEF Ethiopia. The Brazilian Ministry of External Relations, through the Brazilian Agency for Cooperation and the Brazilian Ministries responsible for the planning and implementation of the national WASH policy (namely, the Ministry of Cities, the Ministry of Health through the National Health Foundation, the Ministry of National Integration, the Ministry of Environment and the National Water Agency) worked together with UNICEF to prepare the agenda for the visit, which included high-level meetings and field visits, in order to provide the Ethiopian Delegation with an overview of the water and sewage systems in Brazil at the national, state and municipal levels. 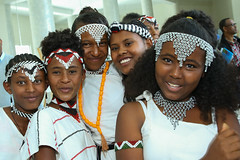 The opening session of the two-day seminar, which took place in Brasilia from 15th to 16th September, was inaugurated by Senior officials of the Brazilian Government, the UNICEF representative in Brazil and DFID Brazil Country Office Manager. The session focused on exchanging ideas on how both the Ethiopian and Brazilian WASH sectors are structured. After the seminar, field visits were conducted in Fortaleza (capital of the Northeastern State of Ceará) and surrounding municipalities, including Sobral and Santana, where the Ethiopian Delegation was warmly greeted by the Mayors and the community, who opened their homes to show the delegation how the water and sewage systems are installed at the household level as well as how they benefit each citizen. On the last day of the mission, the delegation visited the water treatment plant of the Water and Sewage Company of the State of Ceará (CAGECE), and met with its President, who explained the state’s strategy for providing services through public-private partnerships. This meeting was followed by a presentation and discussion with the State Regulatory Agency for these services. The mission was accompanied by Mr. Marcelo Lelis, Project Manager of the National Secretariat of Environmental Sanitation of the Ministry of Cities, and Ms. Michelle Correia, Coordinator of Technical Cooperation of the National Health Foundation of the Ministry of Health, and in Fortaleza by the Superintendent of National Health Foundation, Mr. Regino Antônio de Pinho Filho, besides other technicians who were available to assist the delegation and answer technical questions at all times. As concrete results, by the end of the mission, the representatives of the Ethiopian Government identified key areas in which technical assistance from the Government of Brazil would benefit Ethiopia, by sharing knowledge and building capacities of policy makers, managers and technicians on how to develop WASH integrated policy, implement management models and regulatory schemes for service provision, drawing on Brazilian models like the Integrated Rural Sanitation System (SISAR) and the social tariffs. A child’s example demonstrates the need for integrating educational services for refugees and host communities in western Ethiopia. UNICEF Ethiopia Blog at WordPress.com.